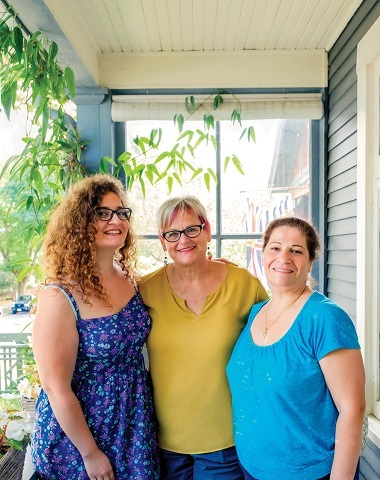 Karen Reed with Syrian refugees – and tremendous cooks – Carmen Aldakhlallah and Hayat Shabo. Photo by Robert Karpa. On a sunny evening in late August, about 60 people are gathered in Karen Reed’s East Vancouver backyard. They sit in chairs – around tables on the patio and on the grass in tight circles – and stand near the open doors of the home. Most of them are neighbours, chatting easily about renovation nightmares, travel plans, new movies. A rich assortment of foliage, blooms and mature trees around the perimeter of the yard gives the gathering a sense of intimacy. The conversations lull as Reed introduces two women that most guests know already: Carmen Aldakhlallah, a 25 year old with a vibrant array of curls, and her mother, Hayat Shabo, who conveys warmth and energy without knowing much English. It’s been almost a year since the two of them stepped on a plane for the first time in Beirut, leaving their war-torn Syrian home and arriving in Vancouver as refugees. They were sponsored by about 25 of these neighbours, who raised funds to cover their travel and living expenses and then helped them adjust to their new lives. Over the next several hours, the neighbours enjoy an immense feast of Damascus cuisine, prepared by Shabo and Aldakhlallah. The platters include: yalanji, rice and veggie mix painstakingly wrapped in grape leaves; kebbeh, thin squares of minced beef with spices and walnuts; freekeh, roasted grain with lamb and almonds; hummus and homebaked pita. Several of the individually crafted entrees appear so festive that many guests mistake them for cookies. Food is a central point of many community gatherings, but it has extra significance for Shabo and Aldakhlallah. Shabo began the preparation for the Sunday meal on Wednesday, and she is unfazed by the task of feeding dozens of people. In Syria, Shabo cooked out of her home, supplying a tourist hotel with traditional delicacies and preparing meals for parties. She trained and employed several women to help her keep up with demand. But all of that was put on hold during the civil war that began in 2011. At the time, Aldakhlallah was 19 and starting a degree in French literature at Damascus University. Her mother, however, was worried and cautious, phoning her every time she heard a bomb or a helicopter. During a time of more intense bombing, she and her husband, Bassam, did not allow Aldakhlallah to attend her final exams, and so she had to study an extra year before graduating. She had just started her master’s degree in French translation when Shabo, who had hardly left her home for three years, was struck and seriously injured by shrapnel in a missile attack. All three of Aldakhlallah’s older sisters had already left Syria, two of them eventually settling in Victoria. But after the tragic loss of her father, who died in an attack, she and her mother decided to leave as well. For nine months they went back and forth between Damascus and Beirut, a four-hour drive, because they needed to be out of Syria to apply for sponsorship but their visas wouldn’t allow them to stay in Lebanon for more than 10 days. Finally, they connected with a church in Calgary, which had been approved by the Canadian government as a Sponsorship Agreement Holder. Karen Reed’s neighbourhood group had made an application to the same church, and they were matched up with Aldakhlallah and Shabo. In September 2016, they made the journey to Vancouver. Hayat, Karen and Carmen enjoying a late summer meal at Parker House. Photo by Robert Karpa. For Reed’s group, the decision to sponsor refugees emerged from years of community building. In 2011, soon after moving to Grandview-Woodlands, Reed started hosting soup nights in an effort to get to know her neighbours better. That small effort grew to an annual progressive dinner, with a series of courses hosted at different homes. Reed found her own connections deepening. In November 2015, the idea of sponsoring a Syrian family came up at one of these gatherings, and someone asked Reed if she would organize it. She wasn’t sure if the community could do it, but 17 people showed up for the first meeting. The group went on to raise $40,000, and one member rented her basement suite to Aldakhlallah and Shabo. After they arrived, it didn’t take long for Reed to witness Shabo’s talents in the kitchen. She thought that a cooking class would be a great way to connect and help the women practice their English vocabulary. Shabo immediately loved the idea. With the help of a Vancouver Foundation Neighbourhood Small Grant of $450, they held the first class in December 2016 with about 18 people at a neighbour’s home. Shabo smiles in recognition when Reed shares a story about her particular attention to detail: after participants in the class tried to cut parsley for tabbouleh, she put it aside and brought out a stash of her own – the students weren’t slicing finely enough. Then, Shabo was asked to prepare food for 200 people at a Vancouver Foundation event called My Mother’s Home, at which she was one of four refugee and immigrant mothers to speak about her experience. She also made full menus for several private dinners. 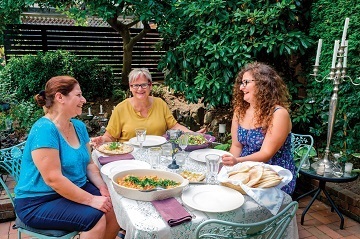 While Aldakhlallah hadn’t been terribly interested in cooking before, she helped her mother, and they began to talk about starting a catering business. By August 2017, they started sketching out a business plan for their company, A Taste of Damascus, looking at commercial kitchens and planning menus. Members of the sponsorship group with business skills offered to help them apply for a GST number and plan a budget. It’s certainly true at the late summer dinner at Reed’s home, as people stay long after dessert (a version of baklava with shredded phyllo pastry, pistachios and honey, loosely translated as “Between the Fire”), chatting beside tall torchlights. Aldakhlallah’s two sisters, Mari and Claire, are here from Victoria with their families, including one small curly-haired boy who was born just months before the family’s arrival in Canada. All of them glow with the energy of reunion. The past year has been full of challenge, says Aldakhlallah, but she knows that she and her mother have come a long way. 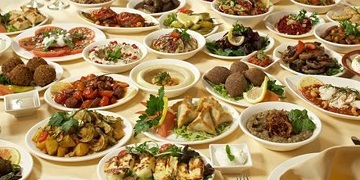 ‘A Taste of Damascus’ Pop-up Syrian Dinner will be held at Parker House November 12. Hayat and Carmen will host A Taste of Damascus Pop-up Syrian Dinner next Sunday (November 12) at Parker House in the Commercial Drive area. All are welcome. To gain a fuller sense of Karen Reed’s approach to community building, watch this short YouTube video of her ‘Living Connected to Place’ presentation at Regent College’s Q Commons a couple of years ago.